This is a CIRCOPACK value bundle comprising 20 pieces of Circo Innovations' 4 x 1-1/4 inch Light Grip Snap Clamps (#14EZ). Please refer to the images on sizing. Look out for the Copyright CIRCOPACK packaging art to ensure that you have a genuine product. This is a CIRCOPACK value bundle comprising 20 pieces of Circo Innovations' 4 inch x 1 ¼ inch Light Grip Snap Clamps. Please refer to the images on sizing. Look out for the Copyright CIRCOPACK packaging art to ensure you are receiving a genuine product. Used to attach tarps or netting to pipe. These Light Grip ABS Snap Clamps have a higher temperature resistance and gripping strength. These are compatible with many types of pipe, including PVC & EMT (metal conduit). Some applications include greenhouses, row covers, shelters, bird protection, dog beds, and quilting frames. Inside Diameter (ID) of clamp is 1.52 in. 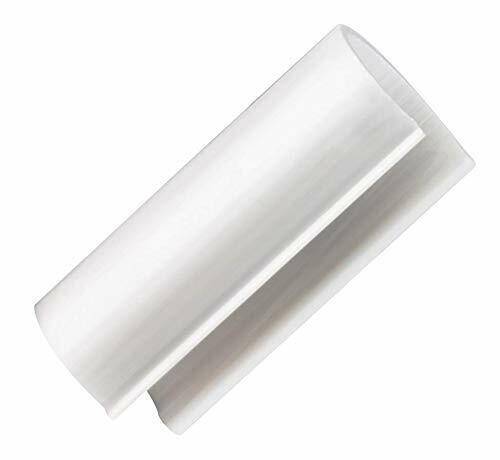 Fits around 1 1/4" Schedule 40 PVC pipe with an outside diameter (OD) of 1.660 inches. The allowed range is 1.657"-1.664". If you have any questions about this product by CIRCOPACK, contact us by completing and submitting the form below. If you are looking for a specif part number, please include it with your message.